Chirk Trout Farm and Smokery is a varied business that covers a trout farm with live fish sales, a contract smokery and top quality food from smoked fish to ready meals. They can often be found at farmer’s markets and food festivals and they also have their own farm shop at their premises in the Ceiriog Valley, near Chirk. They previously had a website but it had never been a success and at some point it had been switched off. They had also lost contact with their web developer. 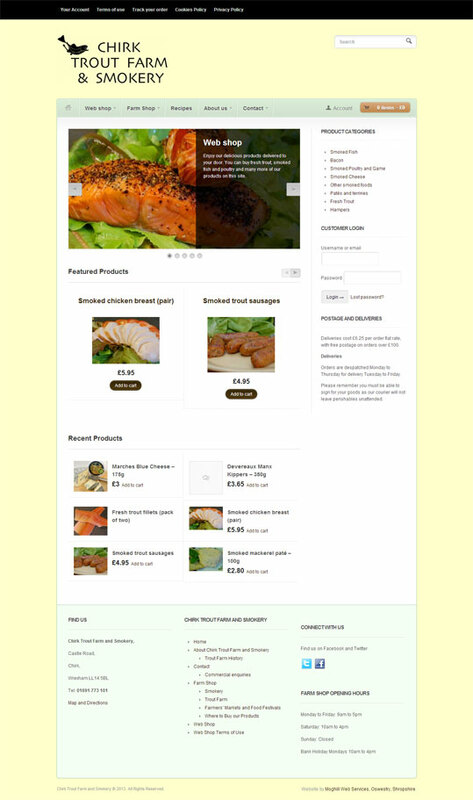 They asked us to build a new website that reflected the various different aspects of the business with an online shop selling a selection of their products. The shop has a clean and modern look and features striking photographs of the products. The photography was part of the package and our web shop software ensured a fast, clean checkout and a shop that is easy for customers to use. .The site launched in February 2013 and we also produced some new leaflets for the business to go with the new site.